This past spring I was thinking about Cami one day and thought "love is wonderful." Immediately after that the idea came to me to make the word wonderful into an acronym and do a brief post about it. Then the lazy side of me kicked in and I had to find a shorter synonym for wonderful. I settled on great. Love is gratitude. When we love someone we feel grateful for them and grateful to have them in our lives. We should not only feel that gratitude but show our spouse that we are grateful for them, grateful that we love them, and grateful that they love us. Love is respect. Loving someone requires some level of respect for them, or at the very least respect for their potential. We see in them what they are and what they can be and honor them as best we can. When we love someone we show them respect. 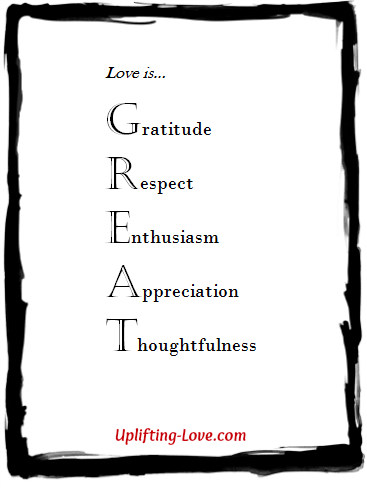 Love is enthusiasm. Are you excited about being in love? You should be! Loving someone should be an adventure and one that you are thrilled to be on. Be enthusiastic about being in love and you'll discover the joy that is yours to claim because you're in love. Love is appreciation. We should appreciate the wonderful things that those we love do both that help us and that are simply great things that they have done or accomplished. But it's not enough to just appreciate what they do we need to show them as well. When we love someone we appreciate them and show it. Love is thoughtfulness. The more we love someone the greater the tendency we have to think about them. Employing these thoughts by turning them into action is being thoughtful. How much does your loved one do? Can you help ease their load? Perhaps a kind word or quick note expressing your love? Be thoughtful. Love really is GREAT. I have never been a better person than I am now and that's because of the love that I have for my beautiful wife, our sons, my family, friends, and others. Love uplifts us, helps us become more than what we were, and does the same for those whom we love. Let's love a little more today.